Cardiff City conceded at least 1 goal in each of their last 10 matches in Premier League. Wolverhampton have scored 42% of their goals after the 75th minute in Premier League. Cardiff City have failed to score in 43% of their home matches in Premier League. 85% of Wolverhampton’s matches had under 2.5 goals in Premier League. Cardiff City conceded at least 1 goal in each of their last 6 home matches in Premier League. 67% of Wolverhampton’s conceded goals were conceded at home in Premier League. Cardiff City conceded at least 1 goal in 86% of their home matches in Premier League. 88% of Cardiff City’s points have been earned at home in Premier League. Cardiff City have scored 82% of their goals at home in Premier League. 83% of Wolverhampton’s goals have been scored in the second half in Premier League. Cardiff City have conceded the opening goal in 77% of their matches in Premier League. Cardiff City have lost 69% of their matches in Premier League. Rayo Vallecano have failed to win in their last 10 matches in La Liga. 72% of Eibar’s points have been earned at home in La Liga. 69% of Rayo Vallecano’s matches had over 2.5 goals scored in La Liga. Rayo Vallecano conceded at least 1 goal in 100% of their home matches in La Liga. Eibar have scored 73% of their goals at home in La Liga. Rayo Vallecano have scored 71% of their goals at home in La Liga. Rayo Vallecano have conceded the opening goal in 77% of their matches in La Liga. Rayo Vallecano have failed to win in their last 7 home matches in La Liga. Rayo Vallecano conceded at least 1 goal in each of their last 7 home matches in La Liga. Rayo Vallecano have conceded 2 goals or more in each of their last 4 matches in La Liga. 32% of Nantes’s conceded goals occurred in the first 15 minutes in Ligue 1. Nantes have conceded the opening goal in 71% of their matches in Ligue 1. Nantes have scored in 71% of their away matches in Ligue 1. Nantes have scored 33% of their goals after the 75th minute in Ligue 1. 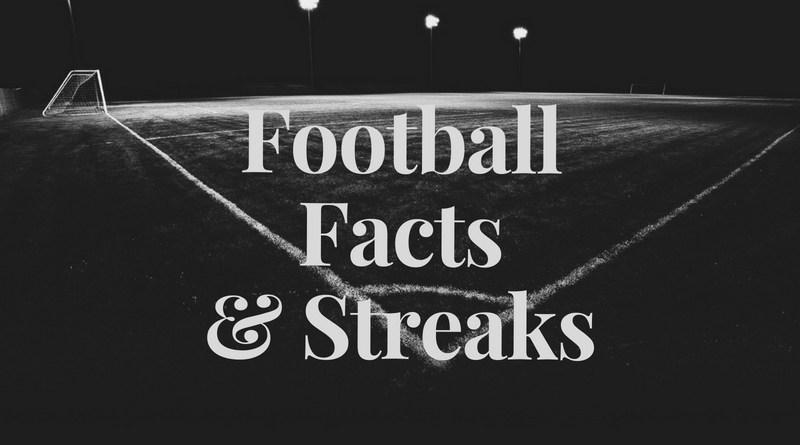 Brest have been undefeated in their last 11 matches in Ligue 2. Chateauroux have conceded 2 goals or more in each of their last 3 home matches in Ligue 2. 80% of Béziers’s matches had under 2.5 goals in Ligue 2. Le Havre conceded at least 1 goal in each of their last 5 home matches in Ligue 2. 33% of Le Havre’s conceded goals occurred after the 75th minute in Ligue 2. Brest conceded at least 1 goal in 88% of their home matches in Ligue 2. Le Havre conceded at least 1 goal in 86% of their home matches in Ligue 2. 67% of Chateauroux’s matches had under 2.5 goals in Ligue 2. Brest conceded at least 1 goal in each of their last 5 home matches in Ligue 2. Chateauroux conceded at least 1 goal in 71% of their home matches in Ligue 2. Düsseldorf conceded at least 1 goal in each of their last 8 matches in Bundesliga. 75% of Düsseldorf’s matches had over 2.5 goals scored in Bundesliga. 77% of Düsseldorf’s goals have been scored in the second half in Bundesliga. Düsseldorf conceded at least 1 goal in each of their last 6 home matches in Bundesliga. Düsseldorf have scored 46% of their goals after the 75th minute in Bundesliga. Bielefeld have scored 38% of their goals after the 75th minute in II Bundesliga. Paderborn have drawn their last 3 home matches in II Bundesliga. Bielefeld have failed to win in their last 7 matches in II Bundesliga. Bielefeld conceded at least 1 goal in each of their last 9 matches in II Bundesliga. 32% of Paderborn’s conceded goals occurred after the 75th minute in II Bundesliga. 64% of Bielefeld’s conceded goals were conceded at home in II Bundesliga. Bielefeld have conceded the opening goal in 71% of their matches in II Bundesliga. Palermo have scored 41% of their goals after the 75th minute in Serie B.
Benevento have scored in each of their last 12 matches in Serie B. 73% of Palermo’s goals have been scored in the second half in Serie B. 83% of Benevento’s matches had over 2.5 goals scored in Serie B. 67% of Palermo’s matches had over 2.5 goals scored in Serie B.
Benevento have scored the opening goal in 75% of their matches in Serie B.
Palermo have been undefeated in their last 7 matches in Serie B.
Benevento have scored in each of their last 5 away matches in Serie B.
Palermo have scored in each of their last 11 matches in Serie B.
Excelsior have scored in 100% of their home matches in Eredivisie. 36% of FC Utrecht’s conceded goals occurred after the 75th minute in Eredivisie. 61% of Excelsior’s conceded goals were conceded at home in Eredivisie. FC Utrecht have scored in each of their last 7 matches in Eredivisie. 76% of FC Utrecht’s points have been earned at home in Eredivisie. Excelsior conceded at least 1 goal in 71% of their home matches in Eredivisie. FC Utrecht have scored 80% of their goals at home in Eredivisie. 86% of FC Utrecht’s conceded goals occured in the second half in Eredivisie. 38% of Colon’s conceded goals occurred after the 75th minute in Primera Division (Argentina). 69% of Belgrano’s matches had under 2.5 goals in Primera Division (Argentina). Colon have scored 62% of their goals in the first half in Primera Division (Argentina). Belgrano have scored 75% of their goals at home in Primera Division (Argentina). Belgrano have scored 75% of their goals in the first half in Primera Division (Argentina). 80% of Colon’s points have been earned at home in Primera Division (Argentina). Belgrano have lost their last 4 away matches in Primera Division (Argentina).